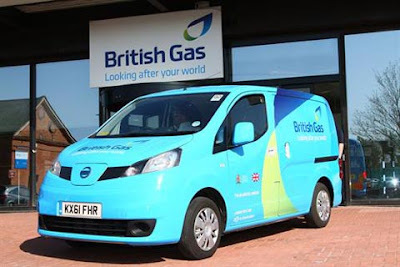 Nissan’s e-NV200 TEST CAR has played its part in helping British Gas kick-start its ambition of switching 10% of its 14,000 light commercial vehicle (LCV) fleet to electric over the next three years. The van was run at maximum gross vehicle weight during the trial which shadowed drivers from British Gas’ national network of trained engineers as they carried out their daily duties of servicing millions of domestic and business customers across the UK. In that time the van covered over 1,200 miles. “British Gas, as a leading energy supplier, is already at the forefront of supporting electric charging innovation in the UK through specialist advice and the installation of charging points for both business and home. With electric cars and vans coming of age, we feel the time is now right for us to introduce electric vans into our fleet and we are currently evaluating the benefits they can bring to UK fleets by implementing them into our own,” explained Colin Marriott, general manager of the British Gas fleet. “With fuel prices continuing to rise, one of the biggest benefits of e-NV200 is the breakthrough in long term running cost savings,” he added. “Over the course of the trial, our e-NV200 TEST CAR drivers have told us they are happy to do away with diesel and go electric,” said Marriott. “Working with large fleets such as British Gas is invaluable to ensure we receive a range of driver and operator feedback on the new van before its launch,” explained Francis Bleasdale, Nissan Motor GB’s LCV sales and marketing director. “The global trial of the e-NV200 TEST CAR is part of our process of making continuous enhancements to the vehicle before unveiling the production vehicle,” he added.